Probashbangla24 online Desk : Southeast Asian foreign ministers urged Myanmar to give a commission of inquiry into the violence in Rakhine state full mandate to hold those who are responsible accountable, Singapore said on Tuesday. The ministers, who met informally on the sidelines of the UN General Assembly last week, expressed grave concern over the violence, Singapore Foreign Minister Vivian Balakrishnan told parliament, calling it “man-made humanitarian disaster”. UN investigators issued a report in late August accusing Myanmar’s military of gang rapes and mass killings with “genocidal intent” in Rakhine and called for the country’s commander-in-chief and five generals to be prosecuted under international law. 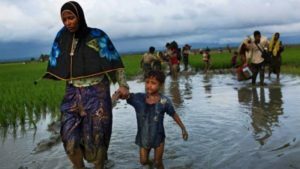 Myanmar has denied most of the allegations in the report, blaming Rohingya “terrorists” for most accounts of atrocities. “They (the Myanmar government) do need to do the right thing…for all the vulnerable, defenseless and innocent victims,” said Balakrishnan. Singapore chairs ASEAN this year and its leaders will meet next month in the city-state.